When English author Ian Fleming published his first James Bond novel in 1953, it introduced the character of M, the Head of the British Secret Service who would subsequently send 007 on many missions to save the world from destruction by megalomaniacs. 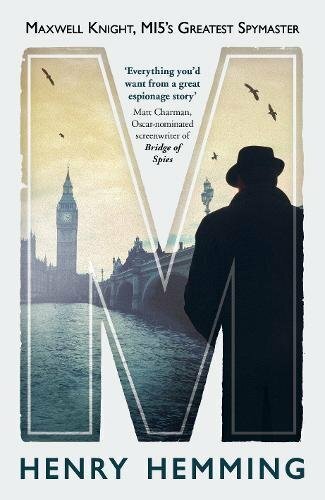 Biographer Hemming tells us that the man with the greatest claim to the moniker M in British intelligence was undoubtedly Maxwell Knight. Fleming, a former naval intelligence officer, never revealed who had inspired M. Studies of Fleming’s life and work agree that Rear Admiral John Godfrey, who was his superior at the Naval Intelligence Division during the Second World War, clearly provided much of M’s character. But Godfrey was never called M.
Maxwell Knight, spymaster at MI5, the United Kingdom’s domestic counter-intelligence and security agency, was known to Fleming. Knight had been known as M within MI5 and beyond since 1931. He ran “M” section. His agents had codenames such as “M/1” and “M/A”. He signed off all correspondence as “M” and had dealings with individuals and organisations throughout the secret world. Born in South Norwood in south London in 1900, Knight is introduced to us as a man adrift, a loser-ish jazz-obsessed family outcast who spent most of his spare time looking after pets and with dreams of not much more than writing cheap pulp fiction. At 23 years old he was basically a drop-out whose great gift in life was his ability to look after animals, and his exotic menageries kept at home included a young baboon, a bear, a bulldog, various reptiles and rodents, a parrot, Indian mongoose and many more. Knight had worked in the civil service, as a paint salesman and teaching games at a school when he was introduced to Sir George Mackgill, who had set up a private intelligence agency for such as factory owners and right-wing industrialists who wanted timely information of forthcoming strikes and the names of prominent communists and trade unionists. Mackgill recruited Knight to infiltrate the British Fascisti, and in just under three years he successfully built up a large network of informants and agents, and had begun to master the art of recruiting and running them. Mackgill’s agency was the parent organisation of the dangerous K paramilitary group, which was responsible for breaking into and wrecking communist offices, a kidnapping and violence. Knight and William Joyce – later “Lord Haw-Haw” – were at its heart, with Joyce’s face slashed from mouth to ear by a razor in one fracas. This was a British society feeling the upheaval of five years of bloody total war and the collapse of the German, Austro-Hungarian, Ottoman and Russian empires and the birth of the Soviet Union. Many people believed that the possibility of a communist uprising in Britain was entirely real, and at stake was nothing less than democracy in Britain and the future of the British Empire. Knight was eventually asked to work for the government, and became a legendary spymaster despite an almost total lack of qualifications. But he had an ability to convince his agents that he was interested in them and them alone, making them feel special and offering tremendous support. He had the wherewithal to transform the most ordinary people into fearless secret agents infiltrating left- and right-wing extremist groups. He was the first in MI5 to grasp the potential of using female agents, managing to engineer situations in which one of his recruits might be given a job as the secretary of an important party figure. There is much more of this unusual life, as laid out by Hemming. Knight had sexual problems and for two years took a break from being a spymaster to become a pub-running fisherman. He wrote 29 natural history books, including the definitive work on how to look after a gorilla, and in late life became a much-loved BBC broadcaster as a naturalist. The greatest secret of his career was his most treasured possession, a gold cigarette case with the royal cipher of King George V and the inscription “Maxwell Knight, 1931”. He had performed some act or service for which the Royal Family was extremely grateful. Maxwell Knight died of a heart attack at the age of 67 in 1968, and Henry Hemming is the worthy chronicler of this strange life.